I didn't know the recipe was going to be the bomb.com. Last week when I posted the photo above on Instagram, I got several questions regarding the recipe. Here's the thing- there was no recipe. You know when you have a killer meal at a restaurant and are craving it so much you say, 'hell, I think I can make that'? Well that's what happened here. After having a delicious meal at a restaurant in LA, I cobbled together a few recipes and waaaaalaaa, here is my version. In a food processor, combine garlic, tahini, lemon juice (2 tbsp), water, and a pinch of salt and pepper. Process until smooth and put aside. Preheat the oven to 350 degrees. While it's warming up, cut the head of cauliflower into 4 steaks. Heat a tsp of coconut oil in a 12" skillet until melted. Add the cauliflower steaks lightly season with salt and pepper, then cook until undersides are golden/lightly charred, about 4 minutes. Transfer steaks onto a coated baking sheet and spritz lightly with lemon juice (1 tsp). Cook steaks for about 15 minutes. While the steaks are cooking, make the couscous according to package instructions. The whole process should take about 6 minutes. Remove steaks from oven once cooked through. While they are cooling, plate the couscous onto four plates. On top of the couscous, drizzle the lemon tahini sauce. After the steaks have cooled slightly (you want to serve them warm), place them atop the couscous and lemon tahini sauce. Top the steaks with capers, the quantity is totally up to you. I think I probably put a tablespoon on each, but I love my salt. Squeeze any remaining lemon juice lightly on top and finish off with a sprinkle of salt. I hope you all enjoy this dish!! Looks so good! I keep wanting to make Cauliflower steaks!! Your pictures look much more appetizing than what I have seen on Pinterest for sure! 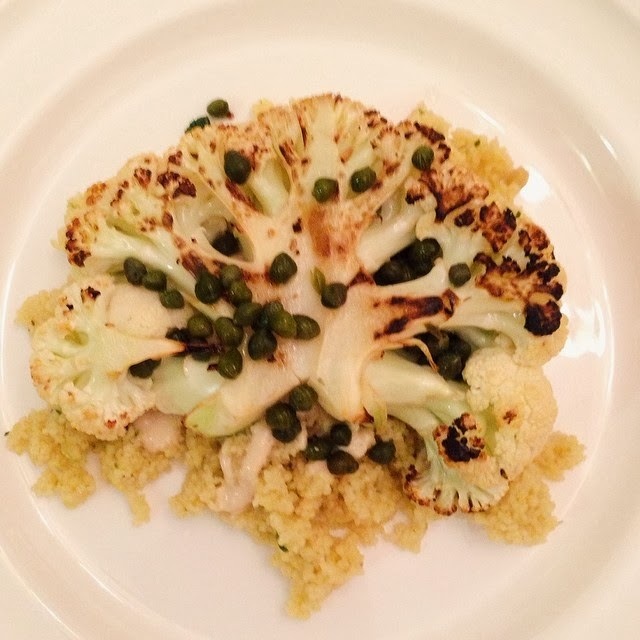 I still chuckle a little at the idea of cauliflower "steaks" !